Mayor Harry Rilling said he would look into the lawsuit, but expressed doubt that a fixed bridge is a reasonable alternative given costs, construction length and the age of the existing Walk Bridge. “What we favor, and what is clearly in the public interest, is for the state to fully consider an existing height fixed bridge option, which costs less, is less disruptive, is less vulnerable to severe weather and future failures to close, and is more practical in every way,” said Penna. Penna is co-owner of A.J. Penna & Son Excavating Contractors, which was forced by the DOT last year to leave its property on Goldstein Place to create staging space for the bridge replacement. The DOT helped the business find a new home at the old National Guard Armory on New Canaan Avenue. Wow...frivolous much? Given that there's a whole bunch of maritime regs governing navigability of the river a fixed bridge can't be at the same level without violating a bunch of other laws. So either the suit challenges the maritime regs in tandem as part of its nebulous environmental argument, or it's barking up the wrong tree entirely. Sad that somebody's trying to chew resources with an "Operation Chaos" of any kind, but it really shouldn't take much to dismiss this as utterly baseless. Figure on a barge customer and a bunch of sailboat owners against a fixed span replacement! Guess the "Harbor Keepers" forgot about them! a fixed span would have a lot more clearance compared to todays bridge , but it would restrict harbor to smaller yachts and a Tugboat with retracting mast. The DOT plans to begin replacing the Walk Bridge in 2019 and raze the existing IMAX Theater at the south end of the aquarium campus to creating staging space for the project. The bridge bisects the aquarium. Aquarium and DOT officials on Monday spoke only generally about the agreement without delving into dollars. The Walk Bridge, which carries approximately 125,000 passengers daily over the Norwalk River, has experienced repeated operational failures, is vulnerable to storm surges and has outlived its 100-year life span, according to the DOT. After studying various alternatives, the department has selected a 240-foot, vertical-life structure as its chosen replacement for the existing bridge. The estimated $1 billion project is expected to take four to five years to complete. Related track and signal upgrades already have started. Any word on if CtDOT (or anyone else) fund an upgrade of the Maybrook from Derby to Danbury to handle either the Tilcon traffic, the stone train, or both while they're replacing WALK? Why would CDOT spend money on a private railroad, without getting anything for it ??? I agree with the sentiment. Believe me. But operational necessity? And yeah, it would be a LONG detour. Wouldn't really be a detour. Quite the opposite- it's more direct, and eliminates a reverse move at South Norwalk. I think P&W would much rather operate via their trackage rights through Derby and Newtown rather than go around the horn through Norwalk. Indeed; the wyes are all set up perfectly, from Derby to Berkshire and around the loop at Danbury. I was more thinking of the Stone Train down to Oak Point, though. It would be longer, but without backing moves, as noted above. Jeff Smith wrote: Indeed; the wyes are all set up perfectly, from Derby to Berkshire and around the loop at Danbury. I was more thinking of the Stone Train down to Oak Point, though. It would be longer, but without backing moves, as noted above. Ah, ok. I thought you were talking about the Danbury stone train that operates from Reed's Gap to the Tilcon plant off Federal Road just south of I-84. A re-routed Oak Point stone train (and presumably the CSX locals, too?) would put more freight on the Danbury Branch than there's been in probably 50+ years. A historic — and historically illuminating — discovery has been made in East Norwalk with the uncovering of the remnants of a contact-period Native American fort. Several thousand artifacts — some thought to be more than 3,000 years old — have also been uncovered at Walk Bridge construction site, including arrowheads, wampum (or traditional shell beads), European flints and iron trade tools, which may shed light on what life was like for Native Americans and Europeans when they first met. Wonder if this will slow up the project any. The Native-American fort archaeological excavation will have no impact on the new bridge's construction schedule. The excavation will be completed by the end of the year. The site will then become part of the New Haven Line's right-of-way. • The Danbury Branch Dockyard Project, which will electrify about a mile of tracks on the southern portion of Metro-North’s Danbury Branch to increase operational flexibility. As part of the Dockyard Project, the Ann Street Bridge is being expanded from two to three tracks to provide train storage. 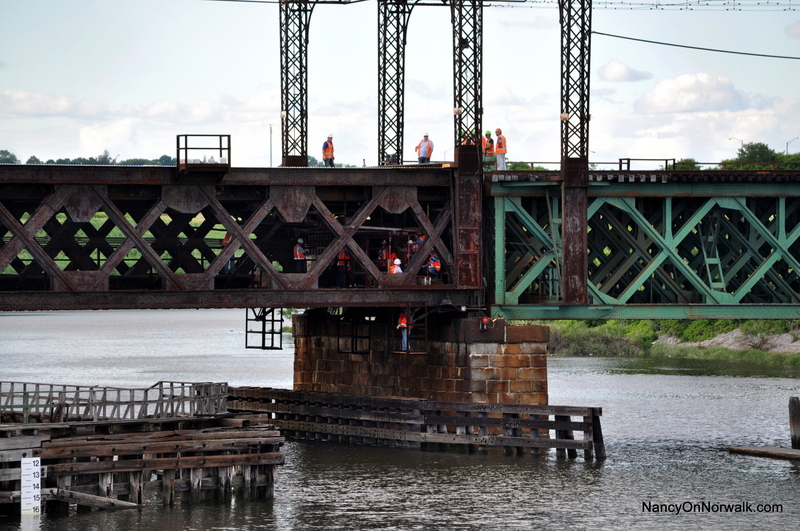 The Connecticut Department of Transportation (CTDOT) will start the first half of the Ann Street Railroad Bridge superstructure replacement during the weekends of June 8-10 and June 15-17. The bridge hosts Metro-North New Haven Line trains. The Ann Street Bridge currently carries two railroad tracks. The renewed bridge will carry a third track to provide train storage. Officials explain that during the first phase of the bridge replacement, crews will install a temporary support of excavation. Once the support of excavation is in place, crews will remove four existing steel girders on the eastern half of the bridge.